The Mississippi Blues Trail marker commemorating the Hi-Hat Club is at the intersection of Old Airport Road at North Hattiesburg Avenue in Hattiesburg, Mississippi. Note that this Mississippi Blues Trail marker is on the former site of the Hi-Hat Club; the Hi-Hat Club building has been torn down and a laundromat now occupies the site. 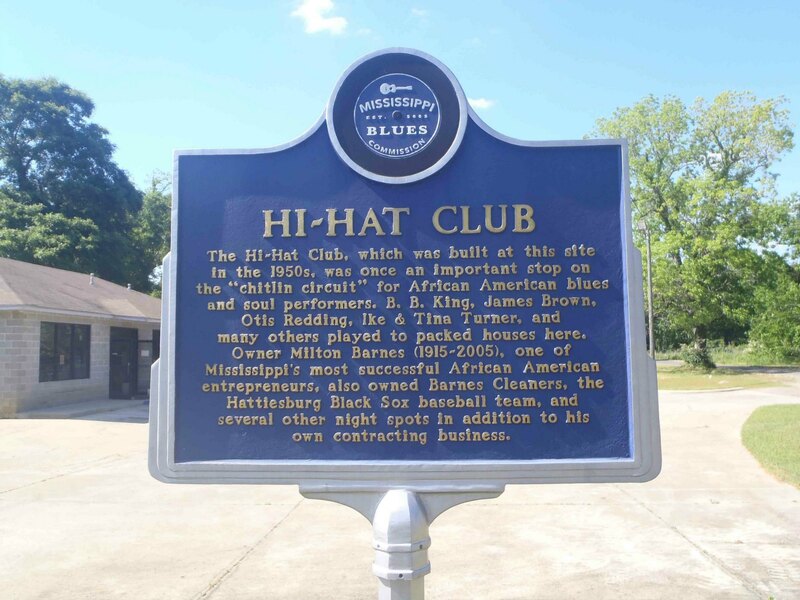 Mississippi Blues Trail marker commemorating the Hi-Hat Club, Hattiesburg, Mississippi. The building on the site is a laundromat. “….Milton Barnes of Hattiesburg in southeastern Mississippi recalled, “At the time it behooved me to go into the club business, I knew nothing about clubs. The man I got [the idea] from, he was out of Memphis, colored guy [“Sunbeam” Mitchell] and his wife [Ernestine Mitchell]…….I told him, “I don’t know nothin’ about the club business, what do I do?” Sunbeam explained the modern medicine-show concept. “He made me a proposition,” Barnes said. “He made his money on whisky, cause we’s dry [note: Mississippi kept Prohibition on alcohol until the 1960s]……You see, when you get that big crowd for a concert, you gonna sell lots of whisky. I had B.B. King on a Sunday night, place was packed. I had sold out of tables, chairs, so we stacked Coca-Cola crates. [We] made money.” Barnes made his from the door. 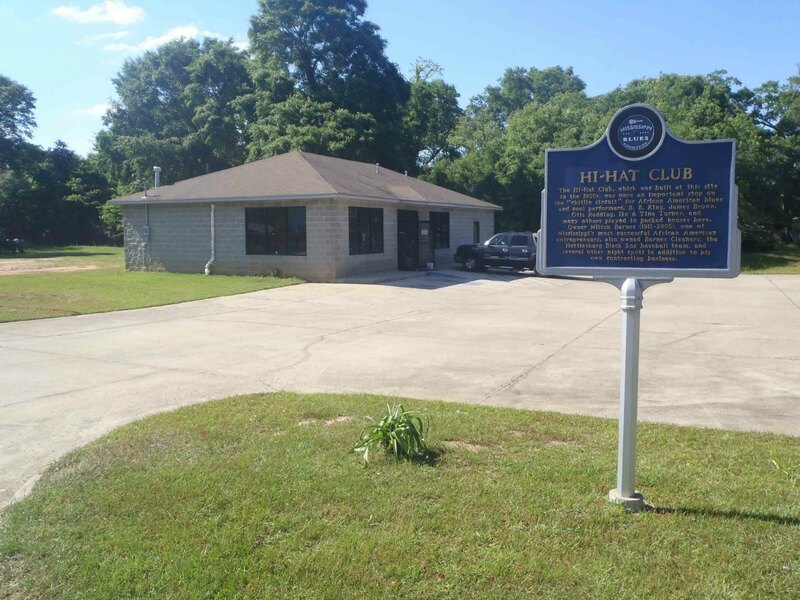 Barnes built the Hi-Hat Club in Hattiesburg around 1950, and in no time he was running joints, down to the Mississippi Gulf Coast, on similar principles……. Other former Chitlin’ Circuit sites on the Mississippi Blues Trail include the Blue Room in Vicksburg, Church Street in Indianola, the Rhythm Club in Natchez, and Chrisman Street in Cleveland. Another Chitlin’ Circuit venue, Club Ebony in Indianola, is still in business. It was owned by B.B. King from 2006 until his death. The Mississippi Blues Trail also commemorates Chitlin’ Circuit promoters like “Hardface” Clanton. Chitlin’ Circuit impressario Sunbeam Mitchell’s wife Ernestine Mitchell ran a brothel in Memphis, Tennessee. The building is now Ernestine and Hazel’s Restaurant. 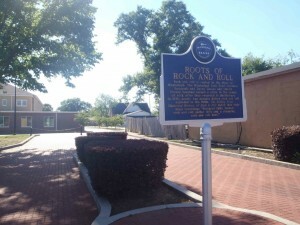 If you’re in Hattiesburg, Mississippi you should also check out the Mississippi Blues Trail marker for Roots of Rock And Roll. 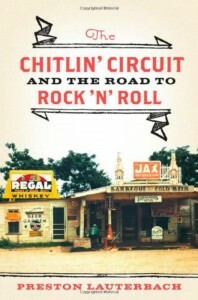 One of Our Recommendations and Recommended Books is The Chitlin’ Circuit and the Road To Rock And Roll by Preston Lauterbach, which gives a lot of very interesting information about Milton Barnes, Sunbeam Mitchell, Harold “Hardface” Clanton, the Blue Room, Club Ebony and other sites on the Mississippi Blues Trail.